Since it's a long weekend for us here in the Philippines, (thanks to All Saints Day and All Souls Day strategically falling on a Thursday and a Friday, respectively), here's a movie recommendation from me. I was really affected after I watched the movie way back 2009 that I could NOT not write even just a simple review and post it on my previous blog. There are actually 2 versions, one done in live action and the other, animated. I have not watched the animated version so this review is that of the former. 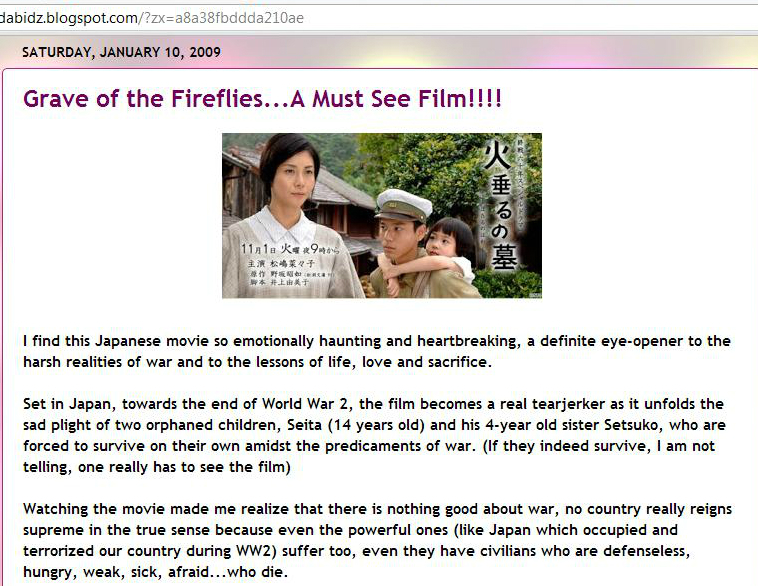 Have you watched Grave of the Fireflies? How has it affected you? I'm a man and yet i got affected by this movie too.